Here are some photos from the first June trip up the mountain. Due to a cancellation, I have one opening in August. Click on 2015 for the dates. Pride and Broken Bow, with Missoula in the background. 2015, Who Will Have Foals This Year? This year has gone by so fast, it is already time for Wild In The Pryors 4th annual “Who Will Have Foals” post. This is based off of the current PZP (birth control) program and include those mares who should not have been given the drug. Of course, not all of these mares may foal and then, like every year, there will most likely be a few surprises. This year the window of “Non-PZP” are the mares born from 2004-2009. I will be including those from 2010 as well. The 2010mares are a maybe. Last year gave us many surprises. This year the list is long, with a possible 28 mares falling into this group (including the 2010 mares). 1. Kitalpha, born in 2010, daughter of Buffalo Girl and Durango. She was with Hidatsa for part of last summer, so I am hoping if she is pregnant, it will be a Kitalpha/Hidatsa foal. I couldn’t think of a more perfect match. She has been seen with a few other Dryhead stallions since then. 2. Jewel, born in 2009, daughter of Waif and Corona. Jewel was with Hawk in April, then several other stallions throughout the rest of the year. 3. Icara, born in 2008, daughter of Waif and Corona. She was with Fools Crow last spring and summer. 4. Halo, born in 2009, daughter of Waif and Corona. She was with Hawk and Fools Crow last spring, then with Hidatsa in July. 5. Fresia, born in 2005, daughter of Buffalo Girl and Durango. Fresia was with Hidalgo last spring and summer. 1. Halcyon, born in 2007, daughter of Blue Sioux and Coronado. Currently in Blue Moon’s Band. Halcyon and Olivia, July 2014. 2. Isadora, born in 2008, daughter of Rosarita and Starman. Currently in Blue Moon’s band. Isadora, had a foal in 2011, Lemhi. Lemhi died in the winter of 2011-12. I would love to see her have another one. Isadora with her mom, Rosarita and her last known living foal, Lemhi, born in 2011. This photo is from July 2011. 3. Gabrielle, born in 2006, daughter of Brumby and Jackson. Currently in Cappuccino’s band. Her known foal was born in 2013. 4. Fiasco, born in 2005, daughter of Topper Too and Chino. Fiasco is currently in Custer’s band. She did not have a foal last year. I am hoping she has one this year. 5. Fools Gold, born in 2005, daughter of Amethyst and Shaman. Fools Gold did not have a foal last year. She was with the Coronado, until Irial stole the band in mid-July, 2014. 6. Graciana, born in 2006, daughter of Bacardi and Baja. Graciana is currently in Duke’s band. Gracianna and her 2014 foal, Odakota. July, 2014. 7. Helenium, born in 2007, daughter of Rosebud and Sandman. Helenium is currently in Duke’s band. Helenium and Outlawlass, August 2014. 8. Hera, born in 2007, daughter of Audobon and Morning Star. Hera is currently in Galaxy’s band. Hera has not had a foal since she has been with Galaxy. I would love to see a Galaxy, Hera foal this year. 9. Greta, born in 2006, daughter of Belle Starr and Chino. Greta is currently in Garcia’s band. 10. Jacinta, born in 2009, daughter of Rosebud and possibly Tecumseh. She has been with Garay since the spring of 2014. 11. Galadrial, born in 2006, daughter of Atlantis and Duke. Galadrial is currently in Gringo/Tecumseh band. (although she and Tecumseh were missing from the band a short while ago). 12. Ketchikan, born in 2010, daughter of Gold Rush and Two Boots. 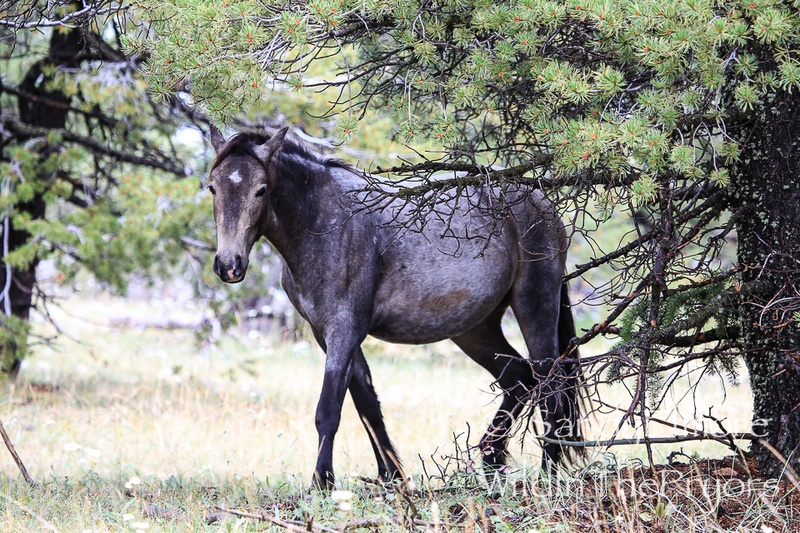 She had a late foal in October, 2014. 13. Kohl, born in 2010, daughter of Quelle Colour and Lakota. Yes, I am hoping for this one. She has been with Garay since, June of 2013. 14. Juniper, born in 2009, daughter of Sapo and Bolder. Juniper is currently in Horizon/Fiesta’s band. 15. Jasmine, born in 2009, she has been with the band stallion Doc, since spring of 2014. 16. Firestorm, born in 2005, daughter of Scarlett and Cloud. She is currently in Doc’s band. 17. Heritage, born in 2007, daughter of Lakota and Warbonnet. She is currently in Doc’s band. Yes, I am hoping for this one too. It should be noted, that I witnessed Heritage have a 24 hour fling with Custer, in late August, so if she has a July foal, it could be Custer’s. 18. Galena, born in 2006, daughter of Blanca and Lakota. Galena is currently in Doc’s band. 19. Half Moon, born in 2007, daughter of Rosarita and Starman. Half Moon is currently in Mescalero’s band. 20. Hataalii, born in 2007, daughter of Sapo and Shaman. Hataalii is currently in Morning Star’s band. 21. Hailstorm, born in 2007, daughter of Aztec and Cloud. She is currently in Morning Star’s band. 22. Gaelic Princess, born in 2006, daughter of Ireland and Prince. She is currently in Morning Star’s band. 23. Feldspar, born in 2005, daughter of Rosarita and Starman. Feldspar is currently in Cloud’s band. 24. Inocentes, born in 2008, daughter of Fiasco and Baja. Inocentes is currently in Cloud’s band. My next post will be “The Name Game”, giving everyone an opportunity to suggest names for these new foals. Remember, it is a “P” year and please try to suggest names fitting to the mare and/or stallion. Some past names have very apparent themes, so we try to stick with those. If you have any questions, please feel free to ask! Summer In The Pryors, 2014, Part 3. My last camping trip of the year was at the end of August. I would be on the mountain for my single longest trip to date, 7 days. I must admit, I was having a hard time thinking about coming off this mountain. It had been my home, pretty much, for the entire summer, and I worried how coming down would affect me. It had been an incredible summer, great guests, some new, some returning, reconnecting with a dear friend from over 30 years ago, it seemed perfect in so many ways, and I found myself dreading the drive off the mountain in this final camping trip of the year. But on this last trip up the mountain, I had with me a friend whom I had just met in June. Bonded by the wild horses, Meg has quickly become a very close friend. This trip was to also be with the University of Montana/ Western students, but Meg and I decided to head up the mountain a day early. The air had a feeling of fall to it, and even though it was just August, I knew there could be some season changing weather ahead of us this week. The 12 students arrived late the following afternoon. Meg and I eagerly pitched in to help them set up camp. accompanying them were 3 faculty members, including a vet. I knew that this group would be too large to camp in my normal spot. 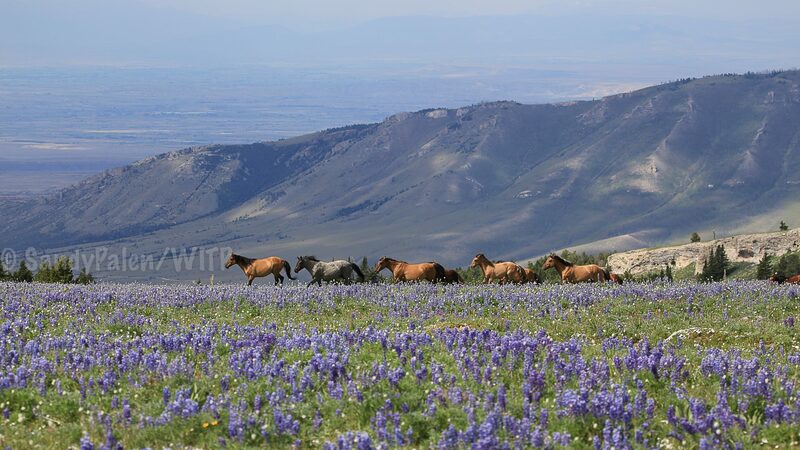 The horses frequented my campsite, and I did not want them to have to change their patterns for such a large group. I had them set up camp tucked in the trees towards Krueger Pond. Anyone that knows me, knows that first and foremost, above anything else, my concern is about the horses, and it did not take me long to realize, this was just going to be too big a group. The students were wonderful, caring, kind, and their enthusiasm was a joy to be around. On one of the first days there, I grab one student and Meg and I took her to get a bit more of an up-close and personal experience with the horses. My plan was to do that several times a day, so that by the end of their 4 days on the mountain, they would each have that experience. But the weather did not co-operate with us, the rain came down hard and with that came the University’s decision to pull up stakes and head down the mountain a day early. In the few days that the students were on the mountain, one interesting thing did occur. Heritage left Doc and went with Custer. Although I am not sure that is how it worked (maybe Custer took her). She did not seem happy with this new situation and was back with Doc after just a couple days. She continued to still look unhappy, (distancing herself from the band a little), even after she returned to Doc. Despite the mud, rain and cold (the high was around 45 most days), Meg and I decided to stay. We were rewarded many times with the mountain to ourselves. It doesn’t get much better, being on the mountain top, with just the horses as company. And by the end of the week, we WERE the only people, both day and night. Each night I crawled into my tent, which by now had a very distinct horse odor to it, and lied there listing to the rain hit it. Reflecting on how good life was up here on the mountain and how blessed I am to be able to be a part of these horses lives. The horses were staying hidden on these rainy days, they were no longer hanging at the campsite, but tucked away deep in the trees to avoid the wet and cold. Meg and I started each morning with a hot cup of coffee and some personal time to do some meditating. On my tour before this one, I had a guest ( thank you Julia) that showed me some meditating yoga moves and I loved starting out each day doing them. Most mornings I hiked a short way, usually to a rocky ridge. This view usually gave me a clear view of the range (and beyond) to reflect and also perhaps to see into my own soul. My own personal church. Even in the pouring rain, Meg and I found the horses. The road was getting very difficult to drive, but we still slowly made our way down to where the horses might be. Most times we were lucky, and spent many hours watching, and just being in their presence . A muddy greeting every morning. One afternoon we watched Miss Olivia (Halcyon and Blue Moon) approach and “greet” Ohanzee. I am going to say she played with him, but rather just put him in his place and let him know who was the boss. Ohanzee wasn’t quite sure what to think of her bold and bossy ways. Olivia is an amazing and very self-assured filly. I look forward to watching her become her “own”. She seems to have the most bold personally that I have seen in a young filly. Another afternoon we spent some personal close up time with Blue Moon’s band and Gringo’s band. Galadrial looked so close to foaling then, but as of today, I have not heard that she has foaled. These mares love to keep us guessing! On our last night on the mountain, it poured rain all night. The temperature was 45 and the wind was blowing hard. I moved my bedroom into the truck that night (Meg was also in her jeep), and I was happy I had made that decision. The rain never stopped and the next morning the road was so muddy I could barely stand up on it. There of course were no horses in sight. We made our coffee and drank it in the truck, hoping that maybe the sun would come out and the rain would stop. It didn’t. So we put on our rain gear, jumped in Meg’s jeep and slid down the muddy road in search of horses. It was as if they were waiting for us that morning. Nine bands were lined up on the edge of the woods, protected by the rain, under trees. Even though it was pouring rain, Meg and I felt joy. Our love for these horses made any kind of weather tolerable and we found ourselves laughing with happiness. The mountain is special, no matter what the day. We spent 6 undisturbed hours with these bands. No other people we on the mountain and no one wanted to come up that day. It was perfect actually. Meg and I had planned to stay one more night. But when we drove back to our campsite, the wind was blowing 30-40 mph and starting to snow. I knew if we did not get out now, we might not get out for a few days. We packed up as fast as we could and were heading down the mountain. I took Sage Creek Road down, knowing Burnt Timber and Crooked Creek would be too unsafe. It was the scariest drive I have done on this mountain. Even going slowly, the mud made the final decision on which way to go, causing me to go a bit too close to the edge a few times. Heading through the Crow Reservation, the mud was easily 1 1/2 feet deep, I prayed I wouldn’t get stuck. But just as I was about to exit the Crow Reservation Road, a Falcon appeared right on the side of my truck. It dove and soared right next to me for about 500 feet, escorting me off the Reservation. A took that as a very good sign, and I am pretty sure it was. 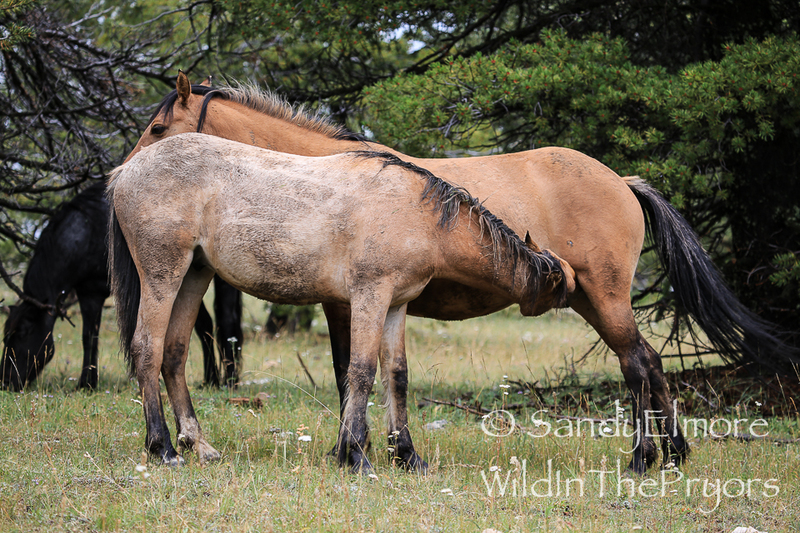 As the summer progressed, I found myself putting my camera down more and just savoring the horses and beauty of the mountain with just my heart and eyes. I still took plenty of photos, but 1000’s of photos shrunk to just a few hundred. The horses were settling into their summer routine with very little conflicts between the bands. There were still a few more foals to be born, but for most part, the foaling season was done by mid-July. As with the post before this one, I am presenting you with many photos to look at, and along with that a few stories to explain what is going on, but mostly, I believe the photos tell their own stories. Coronado gradually adjusted to the loss his band to Irial. For now anyway. I was surprised to discover that Ohanzee had change colors while I was away for about a week. My prediction is that he will end up being a smokey black in color. I saw Chino and Coronado hanging out several times together. Chino is one of those stallions that has excepted his band stallion retirement well. Except for a few “dogging” incidences this spring and summer, he seems content to be by himself, in the company of another older stallion, or teaching a young bachelor a thing or two. As the single oldest stallion at the age of 21, he is doing well. Thin this past spring, but nice and fat this late summer. I hope I am blessed to continue seeing him. He is an incredible stallion. This was the day of Obsidian’s death. A cold windy day that only got more windy after his passing. The bachelors continued to entertain us. One of my favorite things to watch are the bachelors. I watch every detail of their movements. That being said, I will step out and say that I think Jasper may be the next to gain a mare. He seems ready in every way. Grijala watches the “boys in training”. You can almost see the approval on his face. Grijala smiling with approval at the progress Mica has made with his sparring skills. These two were together most of the summer. While they sometimes took a few days off from each other, they were together more often then not. The dysfunctional Bolder band. Killian is still there and still being a handful. Still nursing his mother Celt and still trying to breed the mares. During one trip, myself and guests hiked to the “little ice cave”. In 2012 while searching for the wounded Lakota, I spent some time talking with the “cavers” in this area. They informed me that shortly after the entrance to this cave, it dropped down 6 feet, requiring that to safetly enter this cave, you would need ropes and the proper lights. I don’t really like small, cold, slippery, dark areas with bats flying around, so I never plan to enter this cave. More photos of the “Odd Couple.” Fiesta seems to be a bit further back and not as included as he seemed just a few months ago. I feel sorry for him. He so wants to be included in this band and takes his “Satellite Stallion” position very seriously. Hernando is proving to be a very caring and stable stallion. Having two wise and older mares has certainly helped him achieve this goal faster than most. Both Phoenix and Warbonnet seem to have settled in to being with this young and handsome stallion. Niabrara and Malstrom, Jackson and Firestorm offspring, now members of Hernando’s band. Another new and favorite band of mine is Hamlet and his band. Consisting of Hamlet, Audubon and the yearling filly Niyaha. They went from an isolated spot past Penn’s cabin in June ( I labeled their band The Prisoners” for a short time) to joining all the bands by July. Many times grazing and walking past Audubon and Niyaha’s former band, Morning Star. Garay and his band are doing great. I found it interesting that Quelle Colour (who died this past winter), was replaced by Jacinta, another chestnut, white blaze faced mare who has taken on the position of lead mare. Every summer, I like to be up on the mountain for the full moon. The beauty and energy of it always takes my breath away. This summer was not a disappointment, and I enjoyed every full moon the summer had to offer. Demure and Jupiter showing some affection to each other. Demure was in heat and Jupiter was very protective of her. In the photos below, you can see Knight trying to flirt with Demure, but Jupiter would stood his ground to protect her. Jupiter and Demure after the boys left. August brought the birth of the newest Baja band member, Ojai, a beautiful strong and healthy filly born to the 20-year-old mare, Washakie. An afternoon hike in August, looking for horses and enjoying the beauty of the mountain. In mid-July of this summer brought the new sign dedication in the Bighorn Canyon National Recreation Area. Two of my photos are on the signs. The first one is at the pull off just as you enter the range, the other one is located at Mustang Flats and shares a space with my friend Linda Dombecks photo. In this photo is Galaxy’s band, taken during the 2012 removal. My other photos was taken in September 2011, in this photo is Horizon, Jedidiah (removed in 2012) and Galaxy.